Following the signing of first Subsidy Contracts within the First Call for Proposals of the Interreg IPA CBC Programme Croatia – Serbia 2014-2020 in June 2017, the Managing Authority and the Joint Secretariat organized Project Implementation Workshops in Novi Sad and Vinkovci. 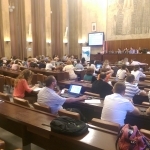 The Implementation Workshop in Novi Sad was held in the premises of the Assembly of the Autonomous Province of Vojvodina while the Implementation Workshop in Vinkovci was held in the premises of the Vukovar-Srijem County Hall. Beside the representatives of the Managing Authority and Joint Secretariat, the representatives of the National Authority and First Level Control in Serbia and Croatia attended the workshops and provided all necessary support to the project partners. Key aspects of project implementation were presented to the participants, such as reporting obligations, reporting in eMS, financial management of the project, project modifications, visibility guidelines, public procurement and first level control, as defined in the Project Implementation Manual followed by Q&A sessions. More than 160 participants attended the workshops that were successful and useful according to the evaluation forms. The presentations held at the workshops can be downloaded HERE.